Watching Jim’s 1977 television special Emmet Otter’s Jug-band Christmas has become a much loved holiday tradition in many families. With a charming story by Russell and Lillian Hoban and anthropomorphic woodland animals created by the Henson workshop, the program met with great acclaim from its debut, first on the CBC, then in the US on HBO and finally on ABC. The positive response was gratifying to Jim, but he was perhaps even more excited by what the show represented in terms of his ability to make magic on the screen. 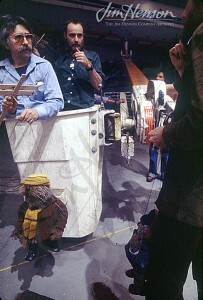 Under the leadership of mechanical wizard Faz Fazakas, Jim’s team was able, for the first time, to perform characters remotely, freeing them from the restrictions set by the need to have a puppeteer next to his character. 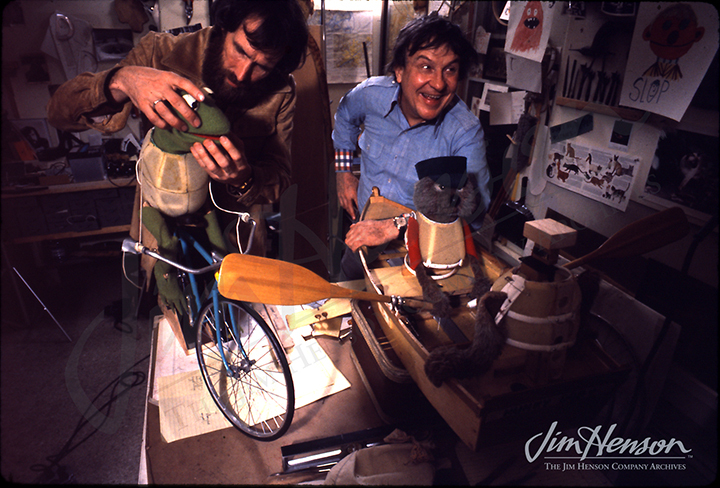 Jim had used marionettes in a limited way to achieve this in the past and for Emmet Otter, he used marionettes to allow Kermit to ride a bike and to have Emmet and friends (awkwardly) walk around the set. But it was Fazakas’s addition of radio control to the performer’s tool box that changed everything. Emmet and his mother, in a boat in the middle of a body of water, could be performed remotely and, most importantly to Jim, believably, by Jerry Nelson and Frank Oz using mitt-like devices called Waldos. This was the beginning of the development of the complicated controls that allowed Jim to make his cinematic masterpiece, The Dark Crystal, and to bring to life the varied denizens of Fraggle Rock. The direct descendants of Emmet Otter would be the Waldo character from Muppet*Vision 3D, the sit-com Dinosaurs, and eventually the digitally controlled classmates from The Jim Henson Company’s current hit show, Sid the Science Kid. See electro-mechanical wizard Faz Fazakas in the Henson workshop during development of The Dark Crystal. 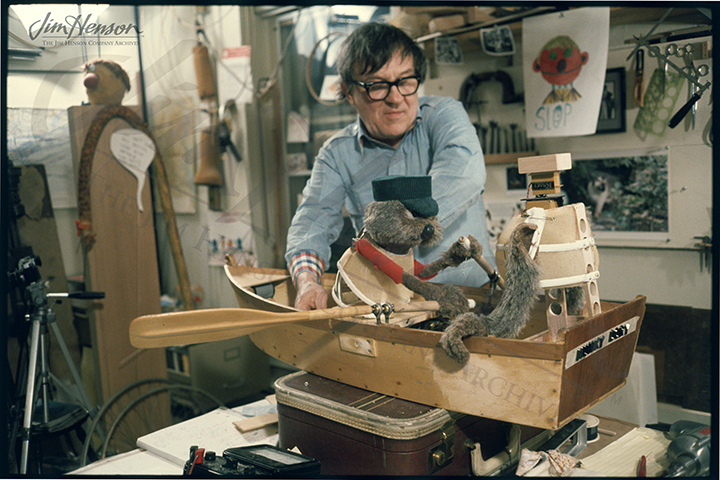 Don Sahlin and Jerry Nelson getting ready to marionette characters from Emmet Otter’s Jug-band Christmas, 1977. Faz Fazakas working on the rowboat for Emmet Otter’s Jug-band Christmas, 1977. Jim adjusts Kermit for Emmet Otter’s Jug-band Christmas in Faz Fazakas’s workshop, 1977. This entry was posted in 03-March '77, 1977, Emmet Otter and tagged Emmet Otter’s Jug-band Christmas, Faz Fazakas, Fraggle Rock, Frank Oz, Jerry Nelson, Kermit, Sid the Science Kid, The Dark Crystal. Bookmark the permalink.